What are the parts of the heart? What are parts of the heart? The heart is a muscle in the body that is about the size of a persons clenched fist. There are three types of muscle in the body: cardiac, smooth, and skeletal. Cardiac muscle cells are located in the walls of the heart, appear striated, and are under involuntary control. The heart has hree layers of tissue which form the heart wall. The outer layer of the heart wall is the epicardium, the middle layer is the myocardium, and the inner layer is the endocardium. What is the path blood takes through the Circulatory System? What are the chambers of the heart? The heart has two sides: the left side and the right side. Each side of the heart is divided into two parts producing 4 chambers. The upper chambers are called the atriums and the lower chambers are the ventricle. The heart not only has four chambers but also has four valves. The atria work are thin-walled chambers and act as primer pumps for the ventricles, which pump blood to the lungs and body. The two ventricles are thick-walled chambers that forcefully pump blood out of the heart to either the lungs or the body. . Differences in thickness of the heart chamber walls are due to variations in the amount of myocardium present, which reflects the amount of force each chamber is required to generate. The right atrium receives deoxygenated blood from systemic veins; the left atrium receives oxygenated blood from the pulmonary veins. The atria collect blood and pump it into the ventricles. The heart can still function without atria however the ventricular output will be less effective. Heart valves keep the blood fluid flowing in one direction in the same way most pumps work. The heart has two types of valves that keep the blood flowing in the correct direction. The valves between the atria and ventricles are called atrioventricular valves (also called cuspid valves), while those at the bases of the large vessels leaving the ventricles are called semilunar valves. The right atrioventricular valve is the tricuspid valve. 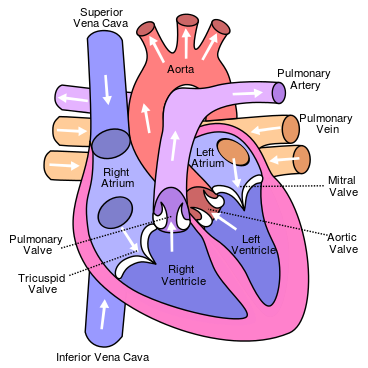 The left atrioventricular valve is the bicuspid, or mitral, valve. The valve between the right ventricle and pulmonary trunk is the pulmonary semilunar valve. The valve between the left ventricle and the aorta is the aortic semilunar valve. When the ventricles contract, atrioventricular valves close to prevent blood from flowing back into the atria. When the ventricles relax, semilunar valves close to prevent blood from flowing back into the ventricles. What are the blood vessels of the heart? Blood flows from the right atrium to the right ventricle, and then is pumped to the lungs to receive oxygen. From the lungs, the blood flows to the left atrium, then to the left ventricle. From there it is pumped to the systemic circulation. The myocardium of the heart wall is a working muscle that needs a continuous supply of oxygen and nutrients to function efficiently. For this reason, cardiac muscle has an extensive network of blood vessels to bring oxygen to the contracting cells and to remove waste products. The right and left coronary arteries, branches of the ascending aorta, supply blood to the walls of the myocardium. After blood passes through the capillaries in the myocardium, it enters a system of cardiac (coronary) veins. Most of the cardiac veins drain into the coronary sinus, which opens into the right atrium. 2. Which chamber of the heart is the most muscular and why? 4. Which of the following statements in not correct? b) The heart not only has four chambers but also has four valves. Why is carbon monoxide so dangerous? How are living things classified?